After drifting south, perhaps from the Virginia coast or heartland, over several generations, my branch of the Hardins settled on the Georgia-Alabama line in Cherokee County, Alabama, and Floyd County, Georgia just after the Cherokees were expelled. My ancestors were the salt-of-the-earth types, the "backbone of America," and cannon fodder whenever they could not escape that fate. Three of my distant Hardin cousins were Confederate privates. Two of them died, while the family they left behind lost a father and two children in 1863, probably to some epidemic. My ancestor Samuel Story was conscripted in Georgia as a private and was only injured. During Korea, two Hardin uncles of mine were killed. 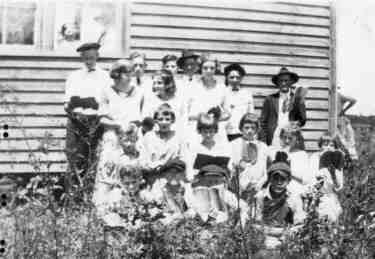 Beyond tragedy, the only fame I have so far encountered is that a distant uncle, James Asa Hardin, was particularly active in securing the consolidated school near Key and Forney, on the Centre-Cave Spring highway in Cherokee County, Alabama. The school, a junior high school, bore his name until it was abandoned, in the 1960's, I believe. There's the tenuous Emma Sansom connection, Emma Samsom being a young Civil War heroine from Gadsden, Alabama. "We're somehow kin to her," my mother would say. Just a little, it turns out. She married Christopher Bullard Johnson, who was the great-grand uncle of my mother. Emma and Christopher Johnson moved to Texas. My ancestors achieved another kind of fame by multiplying, but having lots of children. Until the end of my grandfather's generation -- he had nine children and his wife Minnie died with number 10 -- families of 10 and 12 were the norm for my ancestors. The generation born ater 1920 had far smaller families. This is a searchable and downloadable GEDCOM with footnotes, but note: No living people are listed. Here is the tree that resided at a 2016 snapshot on the Wayback Machine. Here is where my frozen tree now resides at Rootsweb Worldconnect. A differently-formatted tree is at Ancestry.com. The Hardins Oran and I come from are found by DNA testing to be of genotype I1, later called I-M253. Though I have not learned their British ethnic group, the paternal line reaches back to Norse ancestors. I've taken the liberty of calling this related group of which I am a member "Norse Hardins" since nearly all I1 Hardins so far tested are related in recent times. That sounds unusual. It suggests that only one man or only the closely-related descendants of one man were the only immigrant of this line to have come to North America from the British Isles. There are a few men with other surnames whose DNA is nearly identical to the Pendleton Hardins. Each of those cases will have an individual explanation: Adoption, extramarital event, and the like. Either that, or the DNA has been passed down nearly unchanged from generations that lived before the adoption of surnames -- an unlikely explanation since change happen more rapidly than that. For example, two living Plumnelly second cousins have discovered that one has an SNP (single nucleotide polymorphism) that the other does not. Please read the notes and sources in my GEDCOM and the narratives here to determine what is proven and what is supposed. Some people and companies harvest any material that looks like a tree. The tree, accurate or not, becomes indisputable once it enters the collective. That is unfortunate, because I put on the Web trees I am working on. I intend to collaborate with other researchers especially where there are doubts and unknowns -- as there will be with non-remarkable families. I know of no other way to show proposed names and relationships for discussions than to put them on a Web site and invite others to discuss via Web forums, mail lists, e-mail, and telephone whether they approve of my constructions, or if they have corrections for me. 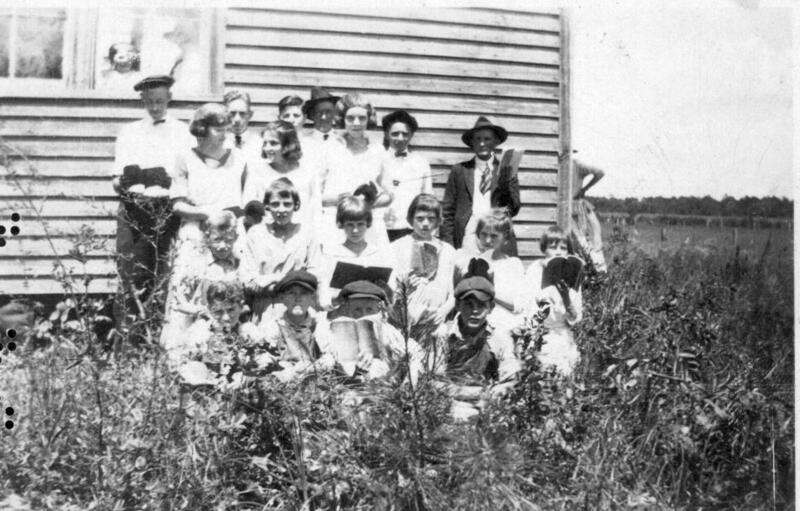 This mystery picture was made about 1917, perhaps at the Farill, Alabama Baptist church. Farill is in Cherokee County, Alabama, near the Georgia line. Many of my ancestors lived there from the 1860's. The girl at far left in the middle row with her head turned was identified by my aunt Katherine as Bertha May Hardin (1902-1987), who married Ed Smith in Birmingham. In the row in front of her, second person from the left, is her cousin Nessie LaVada Hardin (1907-1971), never married. The picture was in the possession of my grandfather Frank Hardin at his death. If you can identify anyone else, please contact me and I will caption the picture. Among the names in the area were: Hardin, Chandler, Bouchellon, Barkley, Story, Ingram, Smith, Isbel, Roe, Kirby,and Mormon. My father's ancestors are Hardin and the other surnames at left above. My mother's ancestors are White, shown above right. Some of my ancestors surely took the same paths of migration as the Scots-Irish, who arrived in the 1700's at Eastern ports, usually Philadelphia. After living for a time in southern Pennsylvania or New Jersey or Maryland, they drifted south over several generations by way of Virginia, the western Carolinas, thence into Georgia and Alabama, and onward to Texas and points west. It is said that Staunton, Virginia is, even today, one of the most Scots-Irish cities in the United States. Whether Scots-Irish or English, in the long term the haplotype I1a Hardin group came from the Scandanavian Vikings, according to the haplogroup maps. Pedigree of Travis Hardin as sent to Bill Hardin 11/8/2017. Kit no. 27191. Color code green. Please use this information to revise the pedigree and also to enter into the index of names. More recent at the top. Older at the bottom. John Hardin, b. ~ 1727 Brunswick County, Va. m. Sarah. He died after 1787. Samuel Hardin, died 1732, Brunswick County, Va. m. Elizabeth.